The root canal is the pulp-filled cavity in the root of a tooth. Root canal therapy is a procedure to replace infected pulp in a root canal with inert material. Because the infection is located inside the tooth, opening the tooth is necessary to eliminate the infection. Before we begin your root canal, we will make sure that you are thoroughly numbed and completely comfortable. At this point, we will drill an access hole into your tooth that allows us to reach the infected part of your tooth. Working through this hole, we will use specialized instruments to clean out bacteria and decayed or infected material. If necessary, we may apply a local antibiotic. Once your tooth is free of infection, we will seal it using a filling material. Your tooth may also be covered with a crown to protect and stabilize it. Some discomfort may remain following the procedure, but this is the result of your body's own inflammatory process. The discomfort will quickly fade once your immune system realizes that the infection is gone. In the meantime, we can prescribe medication to help if necessary. Infection, decay, trauma, and other types of damage to your tooth could create the need for root canal therapy. Most of the time, people who need a root canal are experiencing symptoms that include pain, sensitivity, and abscesses on the gums. In some cases, the need for root canal therapy can be seen on an x-ray or other digital images before symptoms become severe. If this is your situation, we will review your images with you and explain why root canal therapy may be necessary. We recommend treating root canal infections as early as possible to prevent further infection from spreading into other teeth or even the bloodstream. We would also strongly prefer that our patients not experience pain! We know the idea of root canal therapy can be unnerving, but we want to reassure you that the bad reputation associated with the procedure is undeserved. If you are experiencing pain or tenderness or if you have a pimple-like sore on your gum that won't go away, please call our office today for an evaluation so we can get to the bottom of your problem and treat it. What does Root Canal Therapy entail? Root canal therapy involves treating a tooth by eliminating an internal infection, cleaning and disinfecting it, and then filling and sealing the tooth in order to save it. 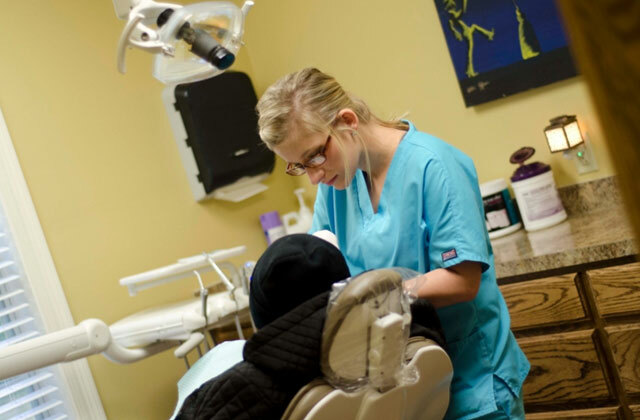 Our experienced dentists will begin root canal therapy once you are numb, comfortable, and relaxed. They start by making a small hole in order to access the tooth's root. The next step is the removal of infection from the tooth. The final step is to fill the tooth with an inert material and medication to assist in the healing of the tooth. A crown may be recommended to protect the tooth after the procedure because root canal therapy can cause your tooth to become brittle and structurally compromised. You may experience some sensitivity following your procedure, but after a few days you should be feeling completely normal. Why should I have Root Canal Therapy instead of an extraction? When patients consider the cost of a root canal combined with a crown, which is sometimes necessary after root canal therapy, they sometimes consider having an extraction instead. An extraction should only be considered a last resort because the consequences of tooth loss are dramatic. When you lose a tooth, it leaves a gap in your smile. Because nothing is there, your remaining teeth could begin to tip, tilt, or shift, creating problems with your bite. Additionally, your teeth act like anchors in your jawbone. Your teeth and jawbone work together to provide stability. When you lose a tooth, your bone may begin to reabsorb in that area. That means the opposing and adjacent teeth could be put at risk because their foundation becomes unstable. If you do have a tooth extracted to save money, you will likely find that tooth replacement is often more expensive than saving a tooth. It is almost always better and more affordable to save your natural tooth, when possible. If you do require an extraction, we offer reliable tooth replacement options including dental implants. Dental implants provide aesthetic and functional advantages over other tooth replacement options. Will I need a crown after my Root Canal Therapy? Because each patient's case is different, we cannot determine what will work best for you before a complete exam. However, we do know that after a root canal procedure, a tooth may become brittle and more susceptible to breaking. A crown is beneficial because it places a protective cover over the entire tooth like a helmet. A crown will help absorb the shock from chewing and protect a delicate tooth. Please contact us so we can arrange a free consultation.